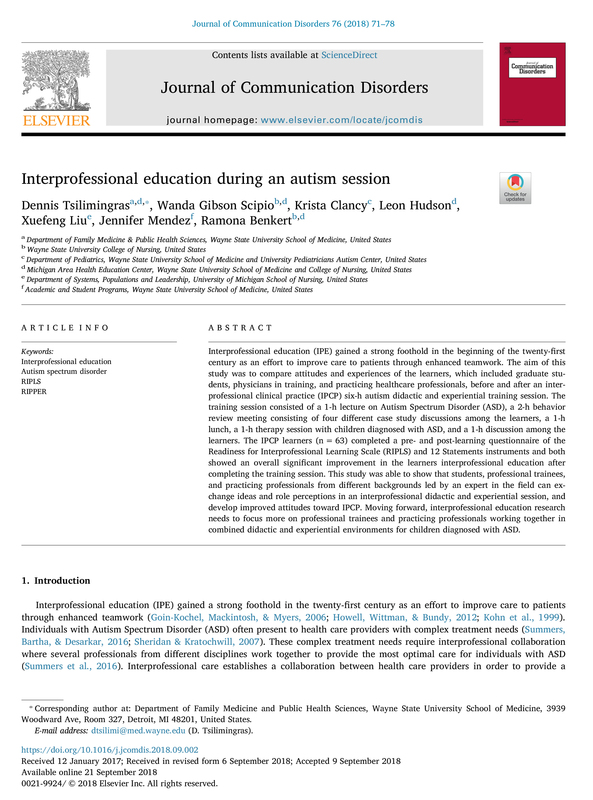 Michigan AHEC Co-Program Director Dennis Tsilimingras, MD MPH, recently published the article "Interprofessional Education During an Autism Session" in the Journal of Communication Disorders 76 (2018) 71-48. Also contributing to the article were Michigan AHEC Co-Program Director Wanda Gibson-Scipio, PhD, FNP-BC, FAANP, Michigan AHEC Co-Prinicipal Investigator Ramona Benkert, PhD, ANP-BC, FAANP and Michigan AHEC Project Manager Leon Hudson, Jr., MPH, EMNO. Dr. Tsilimingras was also recently re-elected to the Michigan Primary Care Consortium's Board of Directors for a three-year term starting in January 2019.